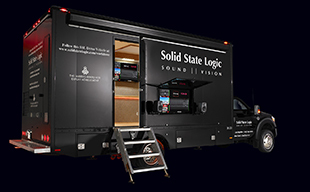 SSL StudioSuperior technology for creative audio professionals. Engine Room Audio in Manhattan, New York has grown from a start-up mastering business to a multifaceted production facility on the 22nd floor of a New York tower. With full recording studio, generous live room, mastering suite, production rooms, and two commercial media tenants, it's making a success of music. Part 1: The new £57 million Royal Birmingham Conservatoire building has officially opened its doors. It's a milestone development that elevates the Conservatoire facilities to world-class status and includes a recording and live sound production infrastructure without compromise, and with SSL very much at its heart. The new equipment list includes four SSL Live consoles and five SSL SuperAnalogue consoles, all connected with a facility-wide Dante network. Part 2: The new £57 million Royal Birmingham Conservatoire building has officially opened its doors. It's a milestone development that elevates the Conservatoire facilities to world-class status and includes a recording and live sound production infrastructure without compromise, and with SSL very much at its heart. The new equipment list includes four SSL Live consoles and five SSL SuperAnalogue consoles, all connected with a facility-wide Dante network. Legendary mixer Chris Lord-Alge talks about the early years, the evolution of Mix LA, and the early breaks. Chris Lord Alge, Part 3: What Makes a Mixer? Legendary Mixer Chris Lord-Alge talks about what he thinks makes a mixer, a Mixer's outlook, and why he still swears by his SSL 4k. Kevin 'Caveman' Shirley talks to SSL about the creative process, production, mixing and how his Duality has found a place at the heart of his personal professional studio. Nicky Romero is a Dutch Producer, DJ, label owner, and EDM legend whose breakthrough tracks include Toulouse (which all-told topped 350 million YouTube views), and I Could Be The One, which got to number one in the UK singles chart. Romero talks to SSL about EDM production, Protocol Recordings, and the new Protocol Studios. A rare insight into Larrabee Studios - one of the world's truly iconic studios, a core player in the Los Angeles music industry for over 40 years, with countless classic recordings having come from it. Today Larrabee is thriving with six SSL rooms and a who's who of resident Mix Engineers and Producers. This video includes interviews with Manny Marroquin, Dave Pensado, Jaycen Joshua, Jimmy Douglas and Kuk Harrell. A quick tour of Larrabee Studios - one of the world's truly iconic studios, a core player in the Los Angeles music industry for over 40 years, with countless classic recordings having come from it. Today Larrabee is thriving with six SSL rooms and a who's who of resident Mix Engineers and Producers. This video includes comment from Manny Marroquin, Dave Pensado, Jaycen Joshua, Jimmy Douglass and Kuk Harrell. Kevin shares more of his personal experiences and insights from over three decades of working with the likes of Led Zeppelin, Aerosmith, Rush and Joe Bonamassa. Herb Tucmandl, CEO and Founder of Vienna Symphonic Library and Synchron Stage Vienna reveals the story behind the creation of this fantastic new facility. Successful sample library and virtual instrument developer Vienna Symphonic Library has opened a new large-scale, high-end scoring stage and studio complex, Synchron Stage Vienna. The complex features two Duality consoles, an L500 live console and a huge Dante network powered by SSL Network I/O. Bernd Mazagg, Technical Director & Chief Audio Engineer at Synchron Stage Vienna discusses the technical and creative ambition behind the venture. Kenta Yonesaka and Dave Rowland from Germano Studios talk to SSL about how they use Duality and their first impressions of δelta Control. Multi Latin Grammy winning Musician and Producer Rafa Sardina talks to SSL about his approach to music production and how his Duality console fits in to his sonic and workflow world. Rafa Sardina, el destacado productor y músico ganador de múltiples Grammys Latinos habla con SSL acerca sus necesidades y preferencias en cuanto a la producción musical y cómo su consola Duality encaja con su mundo sonoro y flujo de trabajo. Producer/artist Mike Skinner of The Streets and The D.O.T talks to SSL about his expansion into the analogue realm. From mixing 100% in the box to his current analogue/DAW hybrid workflow with Duality. PART ONE: Dave Rideau interviews legendary producer/mixer Kevin Shirley, whose credits include Iron Maiden, Journey, Led Zeppelin, Joe Bonnamassa, Aerosmith, The Black Crowes. PART TWO: Dave Rideau interviews legendary producer/mixer Kevin Shirley, whose credits include Iron Maiden, Journey, Led Zeppelin, Rush and Dream Theater. PART THREE: Dave Rideau interviews legendary producer/mixer Kevin Shirley, whose credits include Iron Maiden, Journey, Led Zeppelin, Rush and Dream Theater. "It was exactly what we needed." Insight into The Cutting Room's hybrid studio workflow and what lead the illustrious studio to choose Duality. How do you translate that "live sound" to the control room? Famed engineer Ann Mincieli shares her engineering techniques with SSL. Artist/musician/composer/producer Steve Jordan talks to SSL about his journey into the music industry and the role of the producer in a creative studio environment. Engineer/producer/mixer Greg Penny of Flower Records and Flower Studios shares his views on the future of the record industry. "It sounds fantastic." Producer Greg Haver shares his favourite things about Duality.